Now, get a cup of tea and settle in, because this is a long one (and it comes with a soundtrack). I didn’t think, after nearly a month of distinctly autumnal temperatures, that the thing I’d regret standing on the start line of the Great North Run was that I’d not brought sunscreen. By the afternoon, I had a burnt nose and a tan line where my shorts stopped. 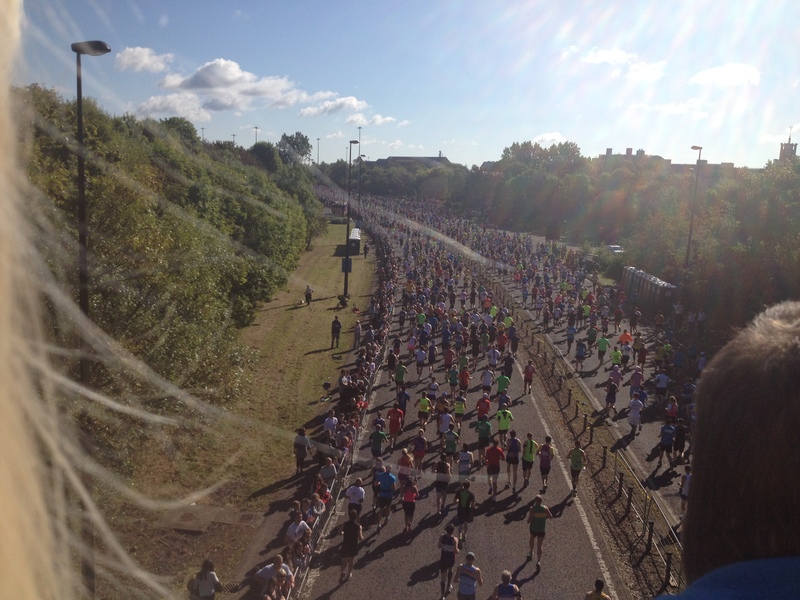 This year would mark the millionth person to cross the finish line at the Great North Run. It is a landmark in mass participation distance running, and it is the first race ever to reach it – long before the same landmark will be reached for the marathons in London and New York. I have to wonder what it must have been like to be Brendan Foster today, to look at what happened in South Shields this afternoon and think: I did that. I’d had better training and better race prep than when I’d last had a crack at this one in 2012, a month into FY1. I had gone nine and a half miles in a shade under two hours on my last long run ten days beforehand, and I was still upright at the end of that. I had tapered, sort of. I had remembered my running shoes. I had packed porridge, because one never quite knows with England and one especially never quite knows in my mum’s kitchen. I did not severely underestimate how long it would take me to find a baggage bus and then my start pen. The night before the night before, which people keep telling me is the one that counts, I had fallen off the train in Newcastle and I had slept well. The only potential issue I had was that, a few weeks before, in the middle of a long run, I had had a bit of a niggle in my IT band and it had lingered for a few days. I had trouble with my left IT band years ago and I am distressingly familiar with what it feels like, but this was on the right side where I have never before had so much as a whimper. But it seemed to have settled itself down with a bit of taping and rolling and ice, and I re-taped it on Sunday morning just to be sure. On Sunday, race morning dawned bright and clear and with just a bit of a bite in the air. It was perfect. “If only it doesn’t get too much hotter than this, this is amazing,” I said. 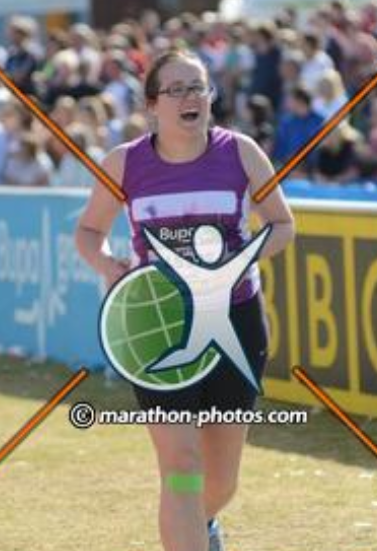 I’d be eating those words by the time the start gun went off – by that time, it was so warm I had already ditched the cheap fleece I’d bought the previous day for start line chucking away in favour of standing about in shorts and a vest. My mum and I walked up Claremont Road, soaking in the sunshine and the buzz as I got last minute water and slathered Vaseline across all my moving parts and found my baggage bus, and then we parted ways, me to head off to the start line and her to stand on the bridge for the start before she began the hike to South Shields by public transport. It seemed like no time at all before Seb Coe fired the gun and Local Hero swept across the crowd. I cried, and I cried all over again when I watched it back on TV later that evening. It took about forty minutes for my pen to get to the front. The wait included the Red Arrows doing their flypast. There is no sight in the world quite like that one. It is one of the memories of my childhood, watching them on television on the day of the Great North Run – a thing that I, uncoordinated and asthmatic and doing well in everything at school except PE, would never have even entertained the idea of doing, but here I was doing it for the second time, and let me tell you, television’s got nothing on real life. A few minutes later, I was across the start line. I hit my Garmin and started running, and out of the speakers came Lindisfarne singing Run For Home. 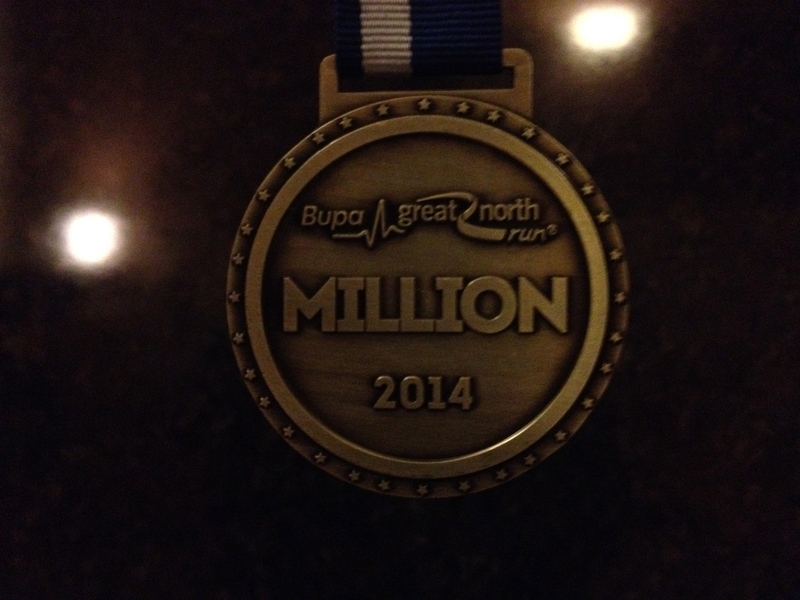 “Run for South Shields,” I thought. The first three miles ticked by quite nicely. They have the high points of the tunnels under the Central Motorway where endless streams of runners shout, “OGGY OGGY OGGY” and then the Tyne Bridge, and after that you’re into Gateshead. I was feeling the heat (so was everyone), but my only real complaint was my sloshing bladder. I couldn’t think beyond the three mile point, where I knew there would be a toilet – one toilet and a queue of about fifteen runners. I would later discover that there were more toilets about two hundred yards up the road, but I didn’t have time to find that out and I wasn’t up for waiting in the queue. I went for the nearest tree and was followed by four more people who seemed to think I had the right idea. I hit three miles at 34 minutes on my Garmin and then didn’t get to the 5K chip mat until 38:20, which will have been the toilet stop. Relieved, I carried on. The stop had somehow made me aware of just how hot it was and I was glad when I saw the sign for a water station 100 yards ahead. I decided to hang onto my water until my Garmin beeped for 3.5 miles, and that I’d have a little walk while I drank it. When I started running again, my IT band went twang. It wasn’t enough then to make me stop, but I think I knew then that I was in for a long day. I took Lucozade at the feed station just before five miles. I had misgivings about taking it, I hadn’t trained with sports drink and the mantra of nothing new on race day was ringing in my head. But I was working hard and sweating badly, and I had taken on a lot of water at the start line and more since then and I was going to be taking on more at every single water station, and I needed to replace electrolytes somehow. I took half a bottle, and that plus the decision to take more at the next feed station would turn out to be the smartest decisions I made all day. I was the only one (so far as I knew) experiencing what felt like really awful toothache in my knee, but the heat was getting to everyone and all around people were being taken into medical tents. St John’s Ambulance were worked very hard on Sunday and they were magnificent. It was turning into the kind of race that, any other day and any other race, I’d have thrown the towel in at six miles. But you don’t do that at the Great North Run unless your leg actually falls off. If you can’t get round, that’s okay, because the wonderful wonderful people of the North East will drag you around. Just before the Black Bull Junction, which is the high point of the course, I went past a woman who was standing alone on the right hand side of the road, most of the spectators being on the other side at that point. “Come on, Beth, you’re doing really well!” she shouted. “You can see the top of the hill now!” And I could and I got there, and soon after that, running when I could and walking when I couldn’t, to the sign on the dual carriageway marking the halfway point. ENJOY THE SECOND HALF! it said. Apart from the 10K chip mat, which I crossed in 1:22:33, I have very little recollection of the third quarter. I vaguely remember that there are a lot more uphills in that section than there seem to be on the elevation profile. I think it might have been here that I overtook Tony The Fridge. My next clear memory is of the roundabout just before 9 miles, which I walked around while having a bit of a chat to a man dressed in a very pink and very sequinned ball dress. I suspect I’m accidentally in a lot of peoples’ photos from that roundabout. “It seemed like a good idea at the time,” he told me. On the other side of that roundabout was the Boost Zone, with more Vaseline (which I didn’t need) and Queen singing Don’t Stop Me Now (which I did). Blisters (a new and unwelcome thing, developing from the biomechanical weirdnesses I was forcing on my body in an attempt to not actually scream at my knee): Oooh, boy. But I hadn’t come all this way to quit now. I had less than four miles to go, and I knew by then that I would finish. Even if I had to walk it in (and I had no intention of doing that), I was going to finish. I started running again. A childrens’ choir singing Let It Go acapella at the side of the road gave my legs a much needed boost and made my eyes suspiciously damp. This is the best road race in the world. I ran from 10.2 miles to 11 miles, which was the longest continuous running I’d managed for some time, and then walked with to Elvis for a little while. A mile and a half from the finish, I exchanged a high five for an orange slice from some kids by the side of the road and I started to run again. “You’re doing amazing,” I said to Elvis. “You aren’t doing so bad yourself,” he said. It was exactly what I needed to hear. Running, slowly and really quite painfully by now, I made it to the water station by the Marsden Rock and to the Scout leader manning it who shouted at me, “You’re nearly there, Beth, the sea’s just down that hill!” There is no sight in the world quite like the Red Arrows doing a Great North Run start line flypast, but even that sight isn’t so beautiful as the sight of the billboard just off that roundabout that proclaims: IT’S THE SEA. I walked to 12 miles before I tried to pick it up again, and from there it was a little run and a little walk and a little run and a little walk and… well, you get the idea. The crowds on South Shields seafront are astonishing. I went past the Kidney Research UK cheering section, who cheered when they saw my shirt. I went past a woman who was on a one woman mission to personally scream to the end every runner who ran by her: “YES, YES, THAT’S IT, GO ON, BETH!” As the finish line came into sight, the millionth finisher, Tracey Cramond, who had been raising money for the Butterwick Hospice, was announced from the stage, and Chariots of Fire swelled through the speakers, bringing me home. Because in my head I am an Olympian. I all but fell across the finish line in 3:06:43 (chip time, my Garmin time rendered almost wholly irrelevant by the detour I took behind that tree at three miles). It wasn’t the race I had planned, but I am very proud of having finished it and I have never worked harder for a medal. I was greeted at the Kidney Research UK tent by my aunt and a very welcome chair and the best cup of tea in the world and a physio with magic hands who proceeded to work my IT band loose enough for me to walk back to South Shields town centre and loose enough that three days later I can walk on it with only mild discomfort going down stairs. I have made the decision to not look at my running shoes this week. (I ran for the bus yesterday and that was far enough, thank you.) I may, possibly, if I feel like it, go for a very gentle swim at the weekend to try to shake everything loose. But, far from deciding that this was terrible and that I must never do it again, I had decided before I’d even bandaged my feet that I’ll be back next year and for Kidney Research UK again if they’ll have me. My donations page is open until December, but thank you so much to all the people who donated. I was doing this for this charity for a very personal reason as well as for a shot at a fantastic event, and it means a great deal to me and to them. 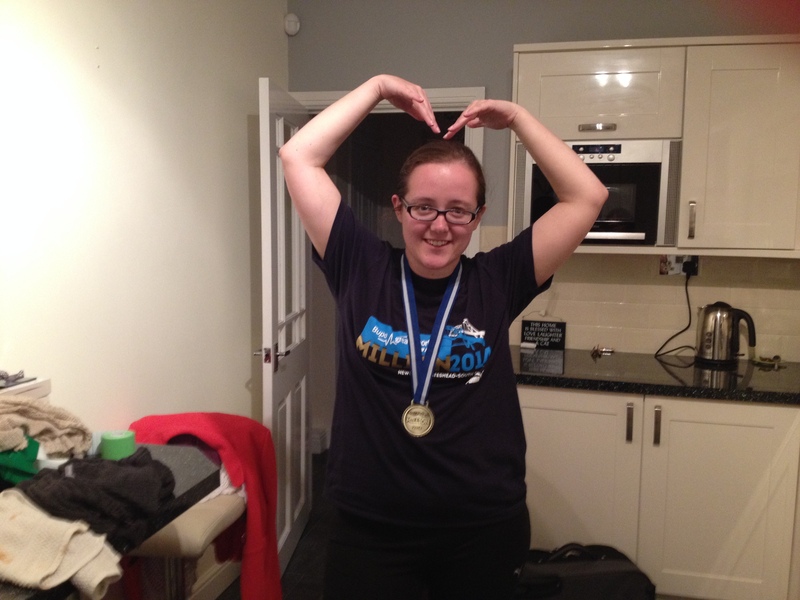 This entry was posted in Blog and tagged #gnrmillion, great north run, in my head i am an olympian, kidney research uk, proud to be a tortoise, running. Bookmark the permalink. I really enjoyed reading that, very well done and what sounds like a very tough 3 hours. You were absent at that particular point when I arrived at the charity village, though. For reasons that I understand! – see above re: three mile pit stop. In accordance with GMC Good Medical Practice 2013, I write under my real name and will provide my GMC number on request. The stories I tell about my work in the NHS have been anonymised, composited, and fictionalised. I do not give medical advice over the Internet, and I do not intend anything I have written to be taken as such. I write in a personal capacity and do not presume to speak for any organisation that I work for, nor for anyone other than myself.